This is what happens in the Islamic Republic in broad day light. This is "Dialogue Amongst Civilisations", this is "Inter Faith Dialogue", this is "Civil Society" and all those other deceiving phrases used by the likes of Khatamis to woo the yoyos outside Iran. A Peugeot stops the passengers in a Paykan. 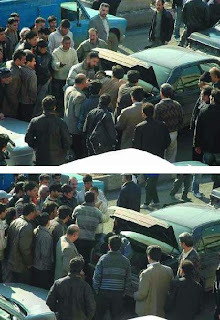 Plain clothes and armed persons from Peugeot, drag the passenger out of his Paykan car. 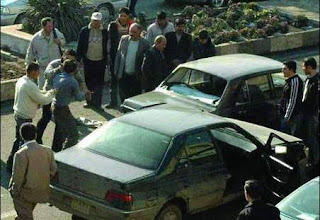 As the passers by look on in disbelief, the Paykan passenger is shoved into the trunk of the Peugeot car. One passer by is seen confronting the kidnappers while the rest can only look on. 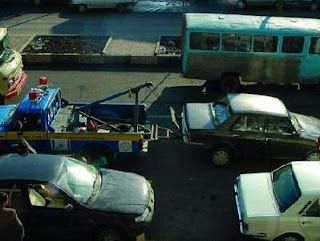 While the fate of the Paykan passenger is unknown, the car is towed away by municipal vehicle removal van. Obviously they consider the population of Iran to be so much baggage. It is sad, and the world needs to see more of this. Please keep shining the light. when did this happen? whats this about? your post is reported at Pajamas Media. Thank you for your blog. I have enjoyed reading it. I hope that soon this sort of thing will not happen and that Iran will be a free secular nation soon. i wonder where Akbar Ganji, former regime agent, is these days...??! !